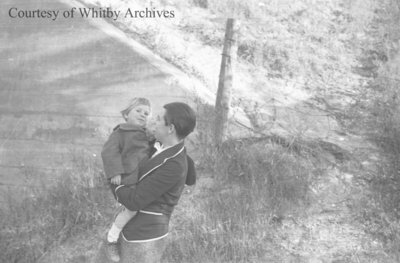 Black and white negative of Marjorie Ruddy holding Eric Adams beside a C.N.R. bridge on October 9, 1938. In this view Marjorie is looking at Eric. Marjorie Ruddy and Eric Adams, October 9, 1938, Marjorie Ruddy. Whitby Archives A2013_040_867C.